Why not get involved with BNF Healthy Eating Week? The British Nutrition Foundation’s (BNF) Healthy Eating Week will be taking place from 11th-15th June. During this week, the charity aims to encourage people to focus on healthy eating and drinking, physical activity, and healthy lifestyles. Taking part in these challenges is a great way for settings and other organisations to show their commitment to supporting the health and wellbeing of children and employees. 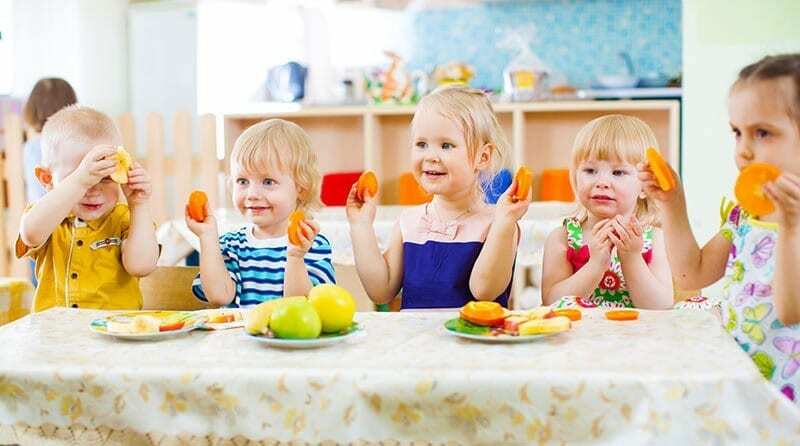 Last year’s Healthy Eating Week was the most successful yet, with over 9,681 nurseries and schools signing up, representing 4.2 million pupils. Once you’ve registered your setting, BNF will send you regular email updates with the latest news and links to free resources to support your week. These will be specifically tailored depending on whether you’re a nursery, school or other type of organisation. Have breakfast – Have a go at preparing a healthy breakfast smoothie. Show the children which ingredients make up the recipe. This is a good opportunity to ask questions such as “What’s this fruit called?”; “Have you tried it?”; “What does it taste like?” You could also ask the children what they had for breakfast and explain why it’s important to eat a healthy breakfast. Eat 5-a-day – Involve the children in a fruit tasting experience and bring along some unusual fruits (perhaps star or dragon fruit). Before you start, hold up what fruits you’re using and see how many the group can name. Ask children what their favourite fruit is and why. This is a great chance to discuss the importance of including a variety of fruit in your diet. Drink plenty – Offer the children at least 6-8 unsweetened drinks every day, such as milk or water. As a group, you could set your children a hydration goal to drink the equivalent of a bath full of drinks during Healthy Eating Week. This is around 80 litres! Draw a big bath chart to display in your room and give children a blue dot sticker each time they have a drink. Get active – Under 5’s should be active for at least 3 hours a day, according to NHS guidelines. Walking, active play and ball games all count as being active. Set mini challenges throughout the week such as throwing a bean bag to a friend and back 3 times without dropping it, or bouncing a ball 3-5 times without stopping. You could even consider starting each morning with a dance routine! In the run-up to Healthy Eating Week, tweets will be sent from @Foodafactoflife giving handy advice and tips for schools and nurseries. On social media, you can share your stories and photos to show your setting is taking part using the hashtag #BNFHEW18.